Panellists on stage at the Global Conference on Primary Health Care. The importance of the local community in reinforcing primary health care – a key message of the Regions for Health Network (RHN) – was acknowledged during the Global Conference on Primary Health Care, which took place in Astana, Kazakhstan, on 25–26 October 2018. This milestone event reinvigorated commitment to primary health care through the endorsement of a new declaration on the critical role of primary health care all over the world. One of the conclusions of the Conference was that global problems need to be addressed through a Health-in-All Policies approach. This involves not only system change, but also comprehensive, whole-of-society change, including all levels of governance: local, regional and national. 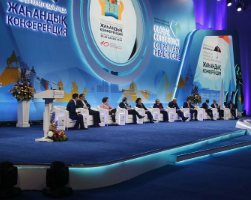 "The Astana Conference firmly acknowledged the need and the role of the local, community level. Accordingly, we need to reinforce the strategic function of the subnational/regional level. Regions play a fundamental role in decentralized intersectoral governance to promote and strengthen primary health care, cooperating among different sectors and organizational levels and actively engaging the community" commented Solvejg Wallyn, Policy Officer at the Flemish Ministry of Welfare, Public Health and Family Affairs Brussels, who represented the Regions for Health Network and the perspective of the subnational level of governance. "Within the Belgian context, the reform of primary health care in Flanders and, most recently, the still ongoing mental health care reform and hospital reform are clear examples that as a Region we do not stand alone and have to work together, linking the national to the local level." The topics addressed during the Conference fully resonated with the priorities of RHN, which were discussed at the 24th annual meeting of the Regions for Health Network: “Building a healthier future for all: a role to play for everyone” in Marstrand and Gothenburg, Sweden, in June 2018. On this occasion, the importance of coordinating strategies at the different levels, from local to national, was emphasized. find ways of collaborating within the hospital sector (private and public), reducing hospitalization for conditions that can be effectively treated in primary health care, and promoting hospital transformation towards a primary-health-care approach. spread the understanding that “leaving no-one behind” is a responsibility, which requires a whole-of-society approach to increasing social cohesion, population health and quality of life.